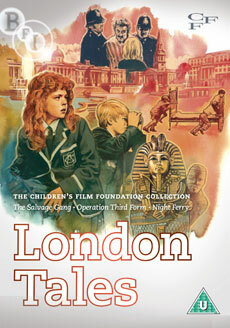 Villains, gangsters and conmen are foiled by plucky London youngsters in this collection from the Children's Film Foundation. For over 30 years the Children's Film Foundation dedicated itself to producing quality entertainment for young audiences, employing the cream of British filmmaking talent. In this first volume of specially-curated DVD releases from the BFI, villains, gangsters and conmen are foiled by plucky London youngsters. The Salvage Gang (50 min): When four children try to raise money to replace a broken saw, their schemes take them on an unexpected journey through the capital. Beautifully photographed, The Salvage Gang by acclaimed director John Krish (I Think They Call Him John) is an affectionate tour of bomb-damaged London, featuring a young Frazer Hines and a cameo by Wilfred Brambell. Operation Third Form (56 min): A fresh-faced John Moulder Brown (Deep End) gives a sparkling performance as the schoolboy out to foil a pair of North London crooks with his crack spy unit – his classmates and kid sister. With its groovy 1960s soundtrack, Operation Third Form, by CFF veteran David Eady, is a pacy boy's own adventure. Night Ferry (58 min): Bernard Cribbins is 'Pyramid', a dastardly master-of-disguise who plans to smuggle an ancient Egyptian mummy out of the country. When young Jeff (Graham Fletcher-Cook) discovers the plan, a dangerous chase via South London's Victoria Station and Clapham Station ensues. Newly transferred from the best-available elements held in the BFI Archive, these much-loved and fondly-remembered family films finally make their welcome return to the screen after many years out of distribution. Brand new Definition transfers of all films. 'Topic - Children's Theatre' (1959, 14 minutes): US TV show Topic on the work of the Children's Film Foundation, with John Krish on the set of The Salvage Gang, J Arthur Rank and CFF director Mary Field. Brand new transfers of all films.